A universal motor is a special type of motor which is designed to run on either DC or single phase AC supply. 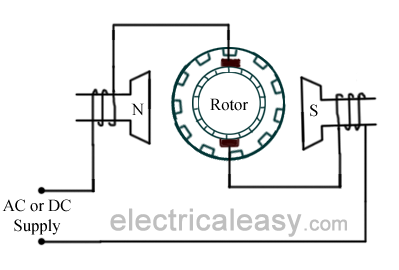 These motors are generally series wound (armature and field winding are in series), and hence produce high starting torque (See characteristics of DC motors here). That is why, universal motors generally comes built into the device they are meant to drive. Most of the universal motors are designed to operate at higher speeds, exceeding 3500 RPM. They run at lower speed on AC supply than they run on DC supply of same voltage, due to the reactance voltage drop which is present in AC and not in DC. Construction of a universal motor is very similar to the construction of a DC machine. It consists of a stator on which field poles are mounted. Field coils are wound on the field poles. 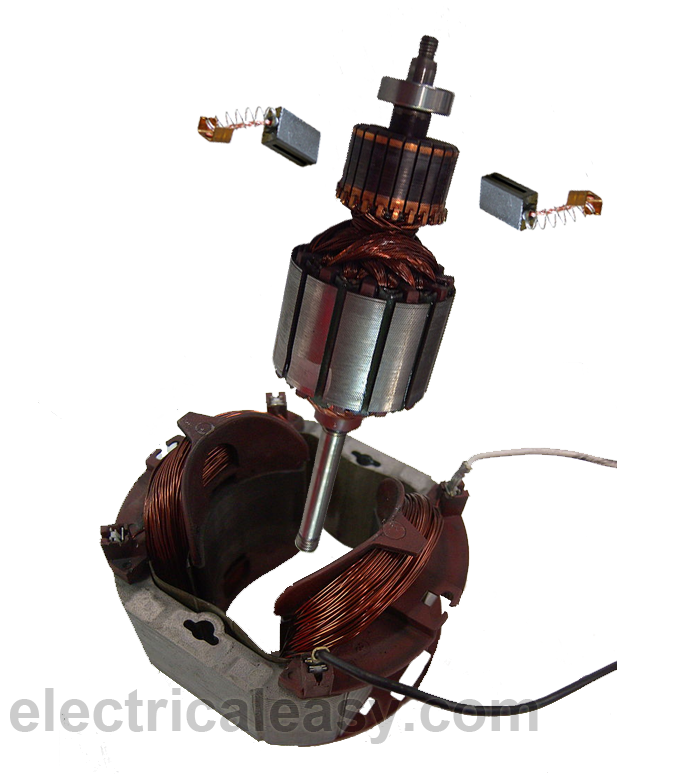 However, the whole magnetic path (stator field circuit and also armature) is laminated. Lamination is necessary to minimize the eddy currents which induce while operating on AC. The rotary armature is of wound type having straight or skewed slots and commutator with brushes resting on it. The commutation on AC is poorer than that for DC. because of the current induced in the armature coils. For that reason brushes used are having high resistance. A universal motor works on either DC or single phase AC supply. When the universal motor is fed with a DC supply, it works as a DC series motor. (see working of a DC series motor here). When current flows in the field winding, it produces an electromagnetic field. The same current also flows from the armature conductors. When a current carrying conductor is placed in an electromagnetic field, it experiences a mechanical force. Due to this mechanical force, or torque, the rotor starts to rotate. The direction of this force is given by Fleming's left hand rule. When fed with AC supply, it still produces unidirectional torque. Because, armature winding and field winding are connected in series, they are in same phase. Hence, as polarity of AC changes periodically, the direction of current in armature and field winding reverses at the same time. Thus, direction of magnetic field and the direction of armature current reverses in such a way that the direction of force experienced by armature conductors remains same. Thus, regardless of AC or DC supply, universal motor works on the same principle that DC series motor works. Speed/load characteristics of a universal motor is similar to that of DC series motor. The speed of a universal motor is low at full load and very high at no load. Usually, gears trains are used to get the required speed on required load. 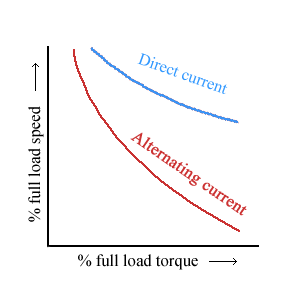 The speed/load characteristics are (for both AC as well as DC supply) are shown in the figure. Universal motors find their use in various home appliances like vacuum cleaners, drink and food mixers, domestic sewing machine etc. The higher rating universal motors are used in portable drills, blenders etc.